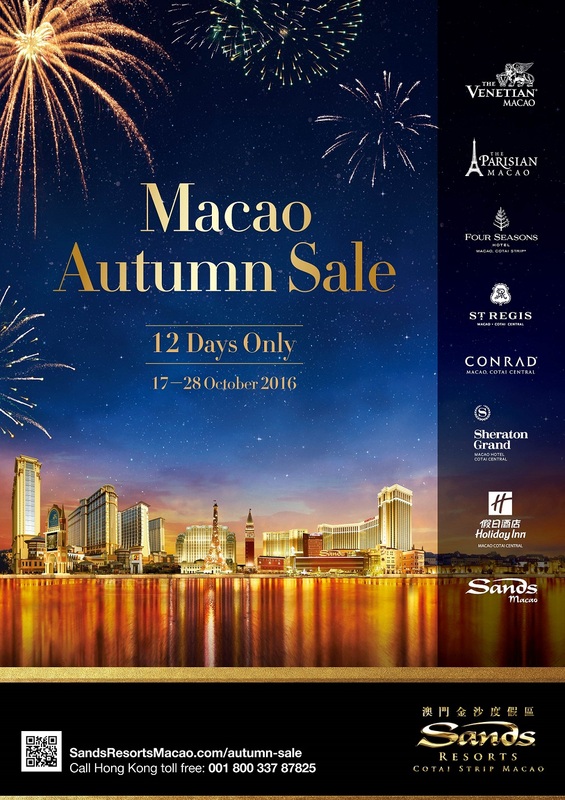 (Macao, Oct. 17, 2016) – Sands Resorts Cotai Strip Macao and Sands Macao are offering amazing savings of up to 40% during the 12-day Macao Autumn Sale available from Oct. 17 – 28, 2016 across all eight properties. Included in the promotional offer, is the option to include tickets to THRILLER LIVE, a tribute to the music of Michael Jackson at the newly opened The Parisian Macao. Rates start from just HKD/MOP688*. During the booking period of the Macao Autumn Sale guests can book rooms from Oct. 17-28, 2016, for stays between Oct. 17, 2016 and June 30, 2017. The limited-time offer provides great deals for visitors who want to enjoy either a luxury or family getaway at either The Venetian Macao; The Parisian Macao; Conrad Macao, Cotai Central; Holiday Inn Macao Cotai Central; Sands Macao; Sheraton Grand Macao Hotel, Cotai Central; Four Seasons Hotel Macao, Cotai Strip; and The St. Regis Macao, Cotai Central. And, for guests keen to catch THRILLER LIVE during their stay, the THRILLER LIVE Package is highly recommended and offers the option to stay at any of the seven hotels. Since the show is only available for a limited time this package is only available for stays between Oct. 19 and Nov. 13, 2016. With accommodation choices to suit all budgets, guests can also indulge in some retail therapy at more than 850 duty free stores, dine at a wide range of award-winning local and international restaurants, and enjoy world-class entertainment during their stay at Sands Resorts Cotai Strip Macao and Sands Macao. Book a room now to enjoy this limited-time sale and experience an exciting world of amazing integrated resorts. Accommodation for two in a Deluxe Room starting from HKD/MOP1,788* per night. Accommodation for two in a Deluxe Room starting from HKD/MOP888* per night. Accommodation for two in a Royale Suite starting from HKD/MOP1,458* per night. Accommodation for two in a Deluxe Room starting from HKD/MOP1,358* per night. Accommodation for two in a Deluxe Room starting from HKD/MOP2,188* per night. Accommodation for two in a Deluxe Room starting from HKD/MOP1,458* per night. Accommodation for two in a Deluxe Room starting from HKD/MOP1,288* per night. Accommodation for two in a Superior Room starting from HKD/MOP1,058* per night. Book early to avoid disappointment as the Macao Autumn Sale is sure to be very popular. THRILLER LIVE, a stunning theatrical concert created to commemorate arguably the world’s greatest ever entertainer, Michael Jackson, is now at the new The Parisian Theatre till Nov. 13, 2016. Direct from London’s West End the show is now in its eighth year, and has performed over 5,000 shows and seen by over four million people in more than 30 countries. The 90-minute, high-energy explosion of pop, rock, soul and disco takes the audience on a magical audio-visual journey through Michael Jackson’s astonishing 45-year musical legacy. Photo caption: Save up to 40% when you book a getaway during the Macao Autumn Sale at Sands Resorts Cotai Strip Macao and Sands Macao.